As many people have asked for a video stream of my presentation, I am now publishing the presentation with text. This will take a while to complete, but I have made a start with slides 7 to 9 published in my blog. My name is Harald Naumann and I am the Sales Director at Tekmodul www.tekmodul.de in Munich. Tekmodul is a Value Added Distributor focusing on radio modules and antennas. By focusing, we know our components very well and can provide the necessary support in addition to competitive pricing. The proceeds from the book sale were reinvested in a VNA for 4000 Euro from MegiQ www.megiq.com and in an antenna radiation pattern test system for 14000 Euro from MeqiQ. The return loss measurements in the lecture were performed with the MegiQ VNA. 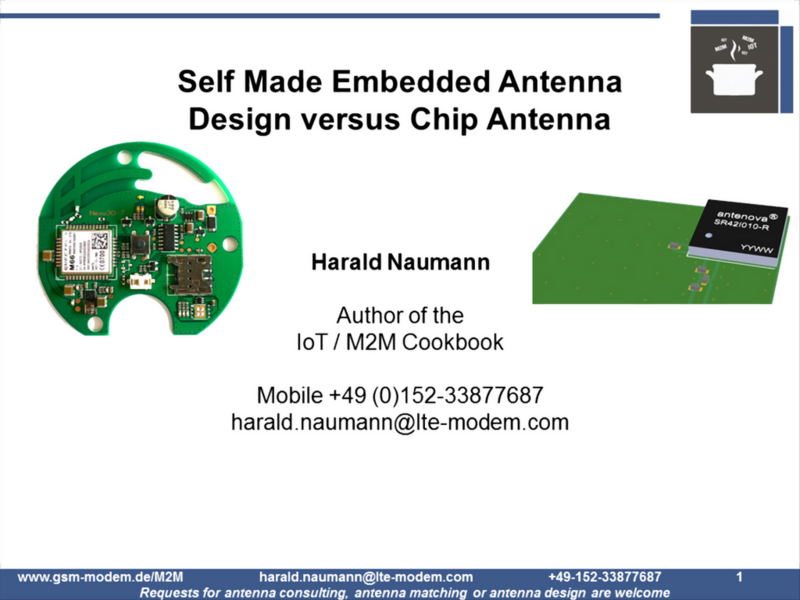 Within four years, Triptec www.triptec.de turned the antenna in the IoT / M2M Cookbook into a leading development team for custom antennas focusing on LPWAN (NB-IoT, LTE-M, LoRaWAN and SIGFOX). We share our experience in seminars and workshops at our customers’ sites. The CTO of Triptec Mr. Wilhelm Oelers and I belong to the akorIoT group with the aim of simplifying IoT developments. Wilhelm Oelers and I are the spin doctors of the akorIoT evaluation kits and reference designs. We launched the world’s first Arduino R3 shield in February 2017 and called it the akorIoT Micro. We have followed up with the akorIoT Nano and akorIoT SensPRO.